On 12 December Dr Jonathan Crofts from Nottingham Trent University gave a seminar on “Complex brain networks in health, development and disease”, as part of the 3rd year undergraduate “Advanced Topics Of Mathematics and Mathematics Seminar” module at the University of Lincoln. This final talk in the seminar series in Semester 1 drew considerable interest from the students and members of staff. 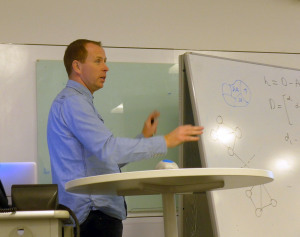 The speaker demonstrated how mathematical methods of linear algebra, network science can be used in various applications to neuroscience and brain diseases, as well as to other social and technological networks. This entry was posted on December 20, 2017 by Evgeny Khukhro in research, Seminar, Teaching, Visitors.